Do you have an I Spy quilt on your to-make list? The hardest part about an I Spy project is finding and collecting all the different fabrics. 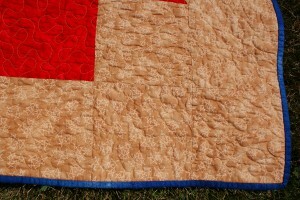 Check out our I Spy quilting fabric category to find lots of fabrics that would work great. Once you collect all your fabrics, here’s a few projects to try. 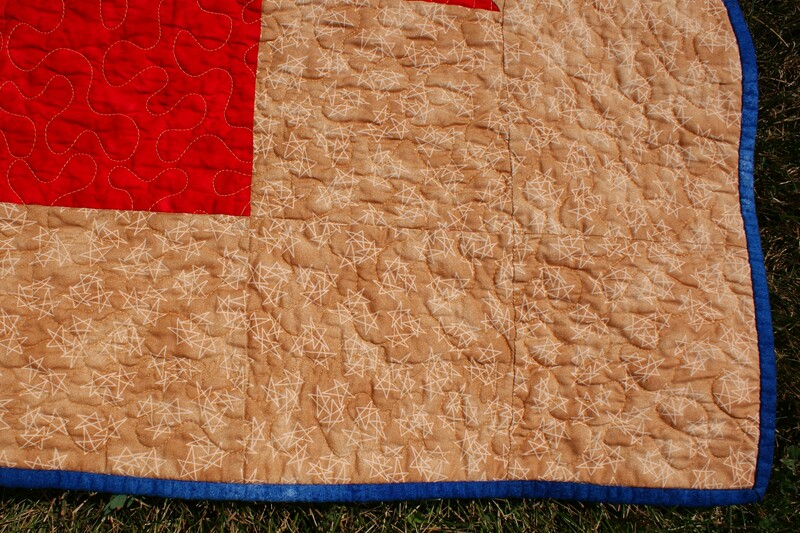 Several nine patch blocks separated by some sashing will make a large lap quilt. Include an extra wide sash and applique your child’s (or grandchild’s) name on the quilt to make it extra special. Make an I Spy banner for your kitchen eating area, or for a child’s room. Use a solid fabric for the back of the banner pieces. From 10 I Spy squares cut 10 triangles. Cut 10 triangles from a solid fabric. With right sides together sew along each long side. Turn right side out and press. From the same solid fabric, cut a 3″ wide strip about 60″ long. Press in half and then fold each side in to the center and press again. Tuck each I Spy triangle inside this strip about an inch apart and sew right along the open edge the entire length of the strip. Fold over each end of the strip a few inches and tack it down to make a loop for hanging. I Spy placemats can create a fun activity for the kids as they are waiting for their meal to be ready. Many patterns can be modified to create I Spy quilts. In Patch of Posies, replace the color centers of the squares with I Spy fabrics. Ribbonworks will frame your fabrics nicely. 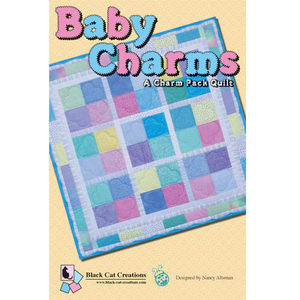 The charm pack pattern, Baby Charms, is ideal for I Spy squares. It would make a great quilt for tummy time. A fun way to collect enough different pieces is to find a swap – or start one yourself. Search yahoo groups, or blogs, or suggest it at your next guild meeting. If you want to start one yourself, here’s how it works: Find 10 quilters (including yourself) that are interested. Each person selects 10 different fabrics and cuts 10 4″ squares from each. You should be able to get 10 4″ squares from one fat quarter. One person (you?!) collects all of these squares, deals out one of each of the 10 fabrics into 10 separate piles. When finished each of the 10 piles should contain 100 4″ squares of different fabrics, which are then distributed to the participants. You may get a few duplicates but most of your fabrics should be different. Then you are ready to choose a project and sew! 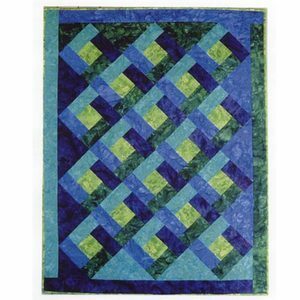 Most quilters are firmly in one camp or the other when it comes to prewashing quilting fabric. Sometimes because they believe strongly in the reasons for their side. And sometimes because that’s what they were taught and it’s become a confirmed habit. There are advantages to each practice. Washing your fabric will let you know ahead of time if a color is going to run. It’s so upsetting to put hours and hours into finishing a quilt and then have a color bleed and ruin your work. Tossing a color catcher in the wash water with your fabric or your quilt can prevent a disaster…. it’s a small price to pay. A pretty red fabric.... much prettier if the red stays where it belongs! The wash water (and it can be just plain water, you don’t really need to add soap) will wash out the chemicals added when the fabric was produced. If you are sensitive to this kind of thing, washing first is a good idea. Both the washer and the dryer will cause the cotton fabric to relax and to shrink a bit. 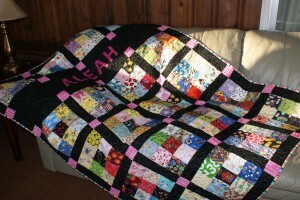 Your finished quilt will be more true to size if you have pre-washed. Now, if you don’t prewash, you get to play with your fabric right away! Washing will usually require that you press the fabric…. no washing = no pressing (unless it was really wrinkled on the bolt). The fabric will also be a little stiffer because of the chemicals and because the fibers are still stretched from the manufacturing process. This means it will be easier to rotary cut. And when you finish your quilt made from unwashed fabrics and run it through the washer and dryer it will come out all crinkly and puckery…. a ready made vintage look! So which camp are you in? Do you prewash? Or do you just jump right in? Do you have any other reasons for which rule you prefer to follow? Morgan Weisling’s Quilting Bee brings you back in time to an old fashioned quilting bee with all the women, young and old, sitting around the quilt frame.� You can almost hear them chatting away as they sew.� And little brother is under the frame listening and probably pestering his sister. Several prize-winning quilts are being admired by attendees in The Quilting Show Circuit Jigsaw Puzzle. In Floating Quilts Over Sisters Jigsaw Puzzle quilts hang on a line in the foreground while quilty hot air ballons float in the sky in the background.� There are chairs just waiting for you to “set a spell” and maybe do some hand sewing. And here’s one where the quilt IS the puzzle.� Well, the quilt�AND a couple of playful kitties.�� Wedding Rings And Kittens Jigsaw Puzzle has 1,000 pieces and looks challenging! 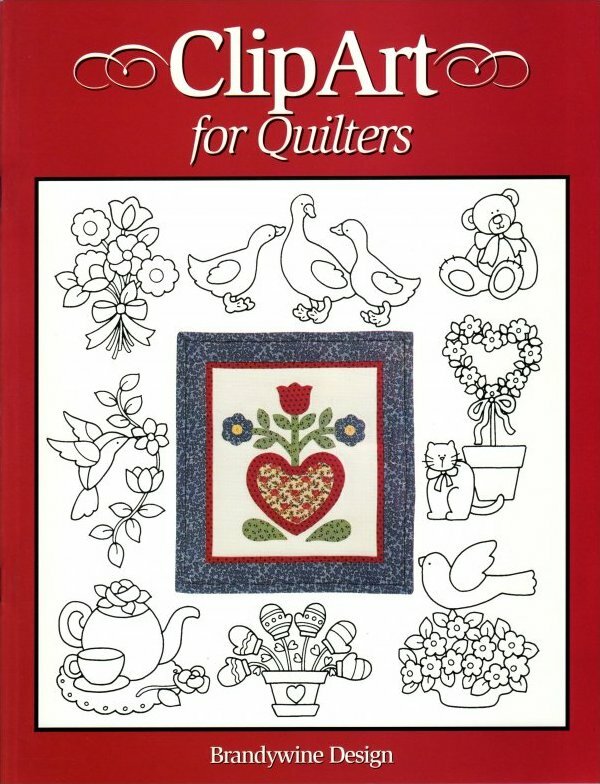 This was just a sampling.� There are more than three dozen Quilt Jigsaw Puzzles to choose from. In the last post you saw a few quilts and a wall hanging offered by Ursula Riegel of Designs To Share With You. As I mentioned there’s lots more than just quilts. A Handful of Fancy Placemats has five different borders, and they’re EASY to sew! Get ready to dress up your table. Also included are matching coasters and “party dresses” for your glasses. Now that your table is covered, here’s A Handful of Cushion Covers for your chairs. 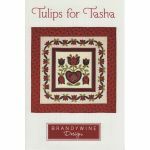 You can skip the pillow pocket portion of construction and use these as little table toppers. They finish at 16″ square. Handy Bags have three compartments and two pockets. Perfect little bag to add to your purse collection. They’d make great gifts too! Pretty Aprons have five deep pockets and four different finishing options. And they are EASY to make! Make one for each holiday or one for each season. Another great gift. You have started sewing for Christmas already, haven’t you? It seems a year doesn’t go by that we don’t have a baby to sew for whether it’s a friend’s baby or a new grandchild or maybe your own! 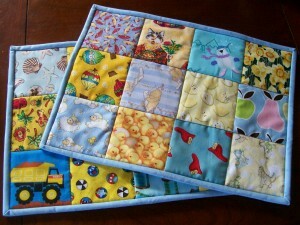 Quilted Baby Gifts includes instructions for bibs in two sizes, a baby quilt, a blankie and a pillow. Designs To Share With You’s “magic mitering” technique makes these quick and easy. Give that refrigerator artwork a decent frame! 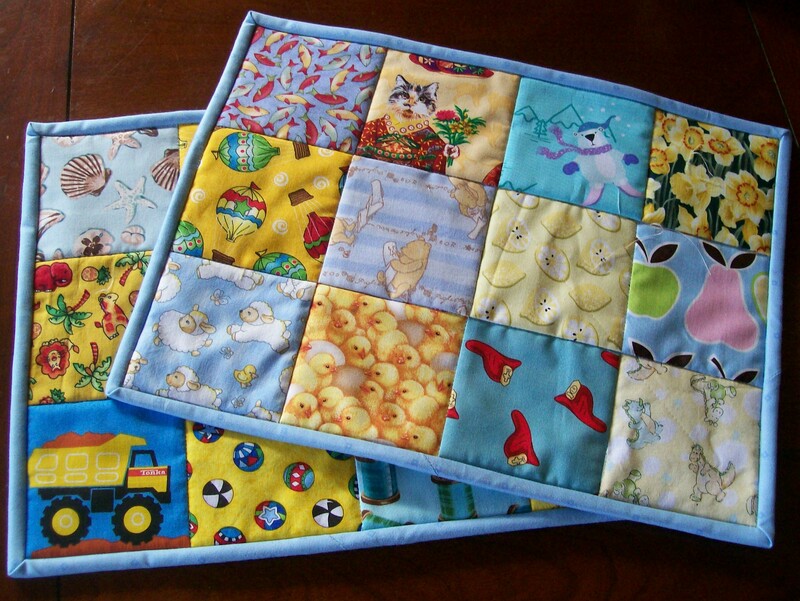 Fridge Quilts & Magnets has instructions for a magnetic quilt with a slide in pocket for artwork, a calendar, or anything you want! Now, that was a lot of variety and you STILL haven’t seen everything that Designs To Share With You has to offer. Browse through the rest and don’t forget to check all the other quilt patterns before you leave! Happy sewing! Whether it’s a dedicated room, a section in the basement, a corner in the family room, or the dining room table when it’s not being used for eating, everyone likes a neat, organized sewing area. We have fabric to store, pins & needles, thread, rulers, patterns and more. This storage box is perfect for storing WIPs (Works In Progress), or patterns. 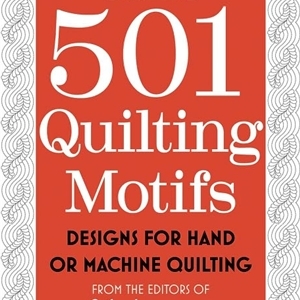 If you are new to quilting and just starting to build your stash, it might hold all of your fat quarters of one particular color. 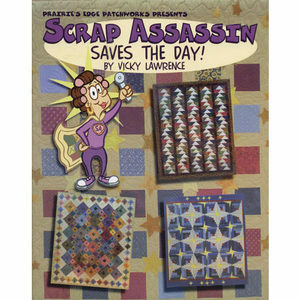 Or if you’ve been quilting for a while, perhaps it would store all of one color of fabric scraps. The Multi-Craft Rack Storage will hold all your pins, needles, thimbles, quilting marking pens, extra bobbins, seam rippers, and more. 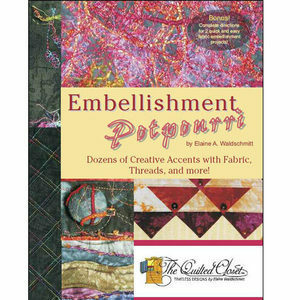 If you like to embellish your quilt projects, think of all the materials for embellishment this will hold. Are you on the go with your quilting? 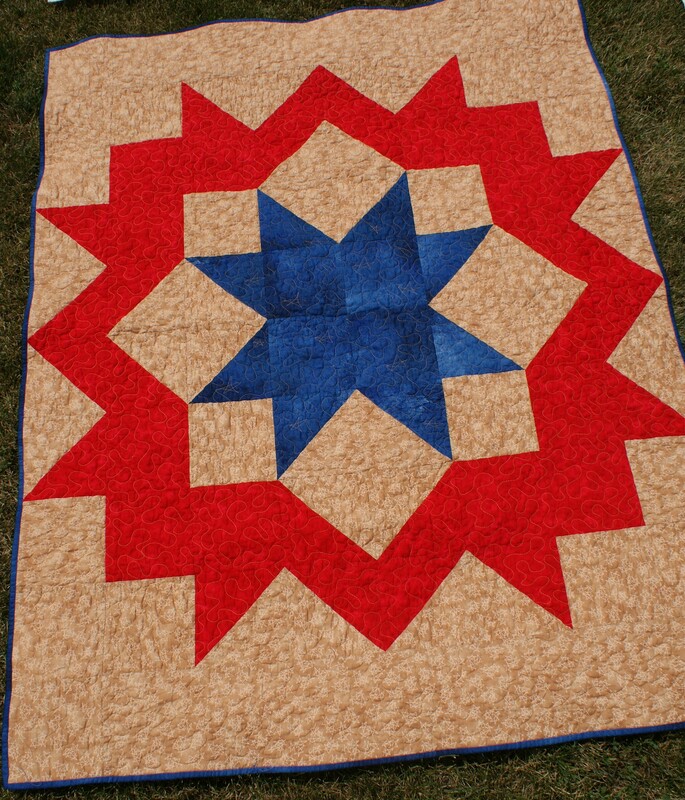 Do you head out to a quilt day at your local quilt shop or to an evening of sewing with your quilt guild? The Total Tote will hold everything you need to take with you. It has storage on each side with adjustable elastic bands to keep things organized and in place. There are several interior pockets. You also have the option of removing the center divider to provide bulk storage. If you are taking your sewing machine along with you this wheeled sewing machine bag will be sure to hold it and still have room for your projects. It has an inside pocket to hold your quilt patterns. When you are not on the go, it collapses and stores easily. Ok, now, no excuses . . . get organized, then get sewing!